Who Needs a Bedside Table Anyway? I am without a beside table. Have been for quite some time. 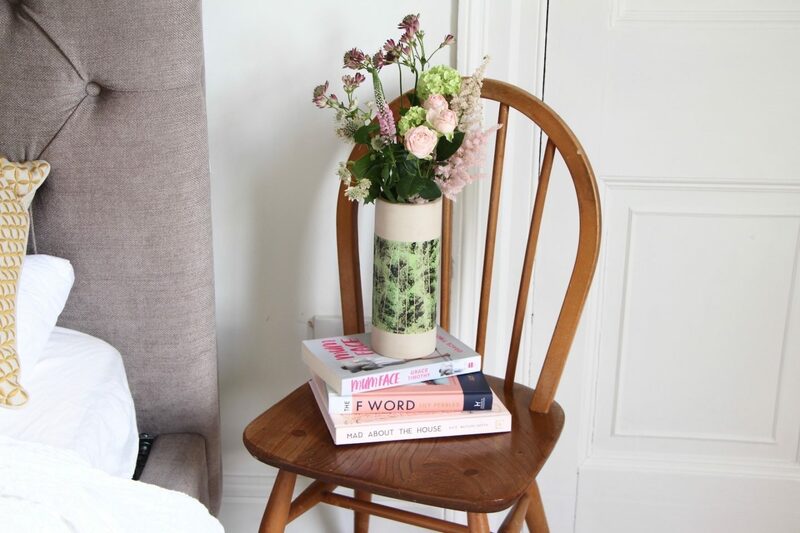 In fact if you follow me on Instagram then you’ll remember this photo from weeks ago – it’s of one of my Ercol vintage kitchen chairs being used as a makeshift book-and-vase stand. Rather more attractive than the empty mattress box that was there previously, but not at all ideal, especially because the seat is curved and I can’t safely stand my pint glass of water on it! I really struggle with finding good bedside tables. I didn’t even find any for my old house, after we’d renovated it – I stuck with the trusty old Malm units from IKEA that we’d used in the house before that one because I had failed to find anything new. And the thing is, I do actually like having a bedside table. I like to have drawers so that I can sweep all of my crap into them, things like old tissues and spent batteries and loyalty cards for shops I’m never going to visit again. I like to keep my drawers stocked with things I’ll never need and make sure that all of the important things – painkillers, new tissues, lip balms, hairbands, a torch – are kept in far-flung places around the house. It makes life interesting. Seriously, though: I do find at least one drawer to be invaluable. Things that I need at night (including ear plugs and scraps of paper to write ideas on) tend to be the sorts of things that I don’t particularly want on display. Never mind the fact that if I leave jewellery out then the human magpies of the house will vanish it away within around three minutes and I’ll have to spend a panicked hour checking that my treasured necklace hasn’t been fed to the dog/flushed down the loo/poked through the hole in the floorboards. So drawers are good, but they do tend to make the tables look a bit square and ugly. Like two stocky blocks sitting either side of the bed, making it seem dowdy and clumsy even if it’s actually rather elegant and chic. Here’s my little collection of alternatives – some aren’t really suitable for my particular bedroom, but I love the idea of them nonetheless. A little bit quirky and a hell of a lot less boring than your typical “matchy matchy” sort of tables that come in the same style as the dresser and wardrobe. 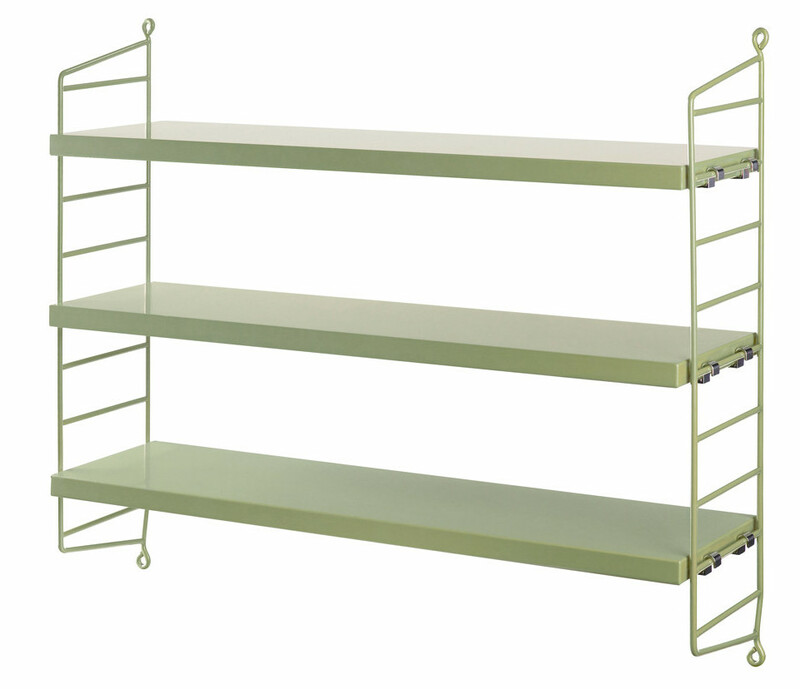 String Pocket Shelves: £122 at Skandium here. 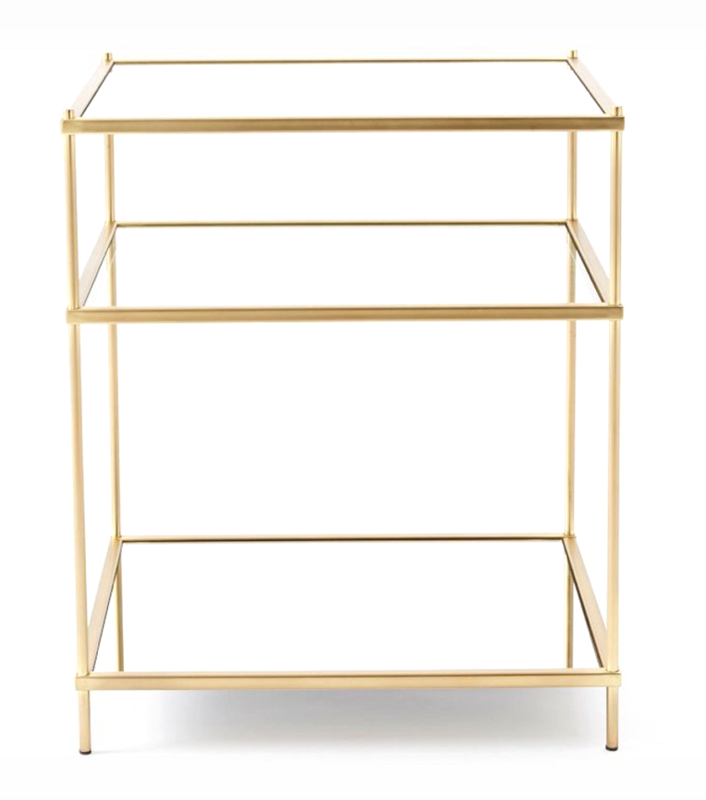 Iconic shelving brand String now has a smaller standalone unit with the same iconic styling. It comes in loads of different colours so that you can almost match it to your walls, if you want to, and the fact that it’s wall-mounted means that you keep your floor-space clear. Artek Stool, £170 from John Lewis here*. 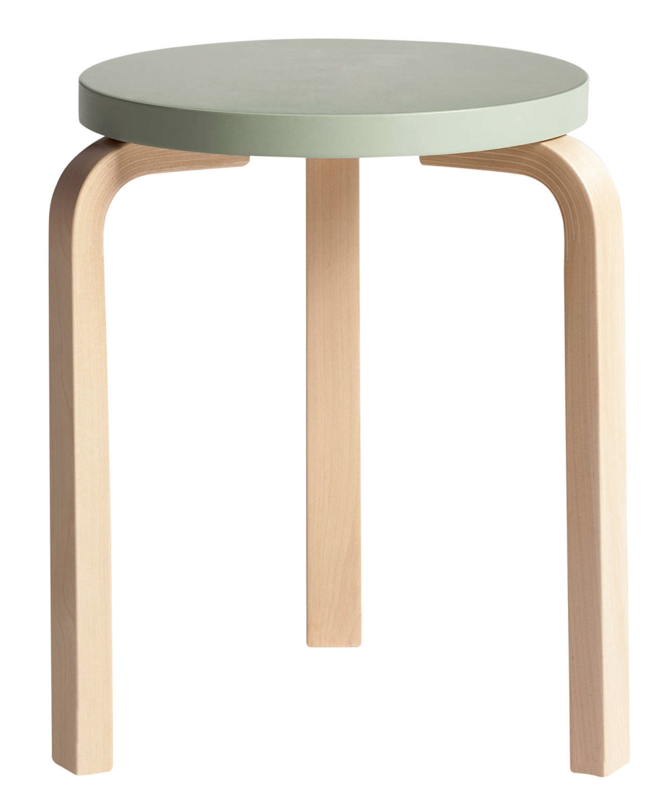 I thought that this stool was so attractive – the colours are pretty but the shape is completely modern and pared-back. 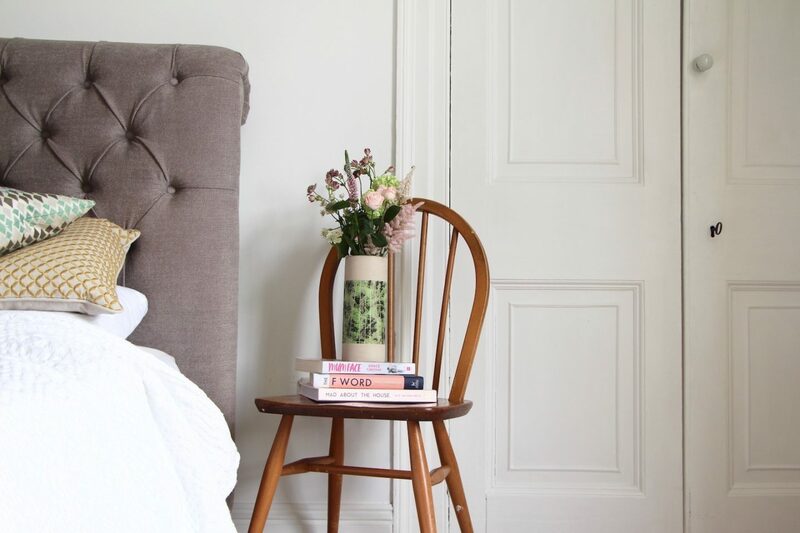 Great if you want something quite feminine but you don’t like fuss – this would be enough to rest your lamp on along with a glass of water and it’s nicely portable if you frequently chop and change your bedroom around! 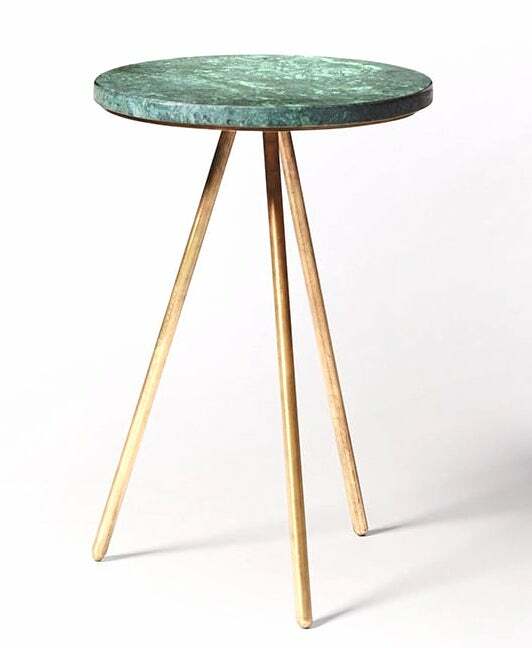 Green Marble & Metallic Side Table, £169 from Swoon Editions here*. Green seems have become a theme in this selection – completely coincidental, because all of the products I’ve shown so far come in other colours – but I love the deep emerald marble top on this occasional table. Which would have an elevated status next to your bed, because it would be an everyday (or night) table, rather than an occasional one. Like the stool, the long legs on this table mean that the floor space is kept relatively clear and looks less cluttered. 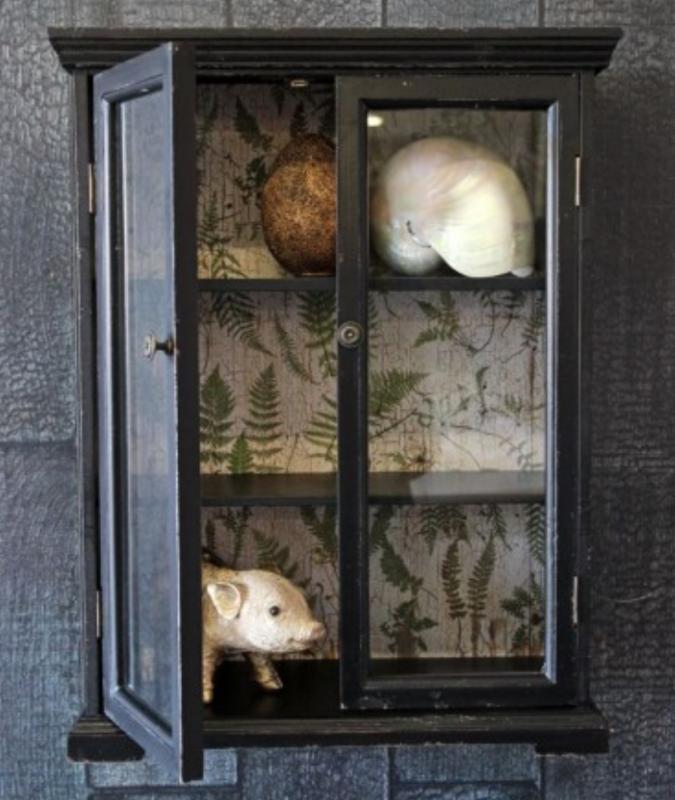 Very appealing, especially in a smaller room..
Black Wall Cabinet with Botanical Lining, £179 from Rockett St George here. I’m thinking of getting the large sized one of these distressed cabinets for my downstairs loo, to showcase all of my weird and wonderful perfume bottles and beauty finds, but the baby version shown here would make a gorgeous bedside cabinet in the right sort of space. Very quirky, doesn’t take up any floorspace and there’s enough room inside to store books, essential toiletries and your collection of semi-burned Diptyque candles. DISCLOSURE POLICY. Posts published after 24th January 2019: if the post contains gifted items or affiliate links then it is indicated clearly beneath the title. Posts published prior to this will have a disclosure within the body of the post and then an asterisk * marking all affiliate links. If the content is a paid-for AD then it is marked as an AD in the title. For more information on disclosure please read here. Ruth Crilly is a writer and content creator who detests talking about herself in the third person. Although she can Blue Steel with the best of them, thanks to a relatively long and successful modelling career, she finds it almost impossible to take herself seriously. She's 38 and lives in rural Somerset with her family and growing menagerie. Juggling work and small children is hard, but not as hard as modelling: she once had to do a lingerie shoot in freezing temperatures wearing a rubber penguin head. Dignity somewhat restored, she now writes about beauty, fashion and her life in the sticks.